I really like this, and have been thinking about it over the last day or so. 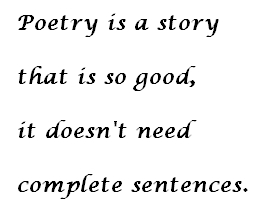 I like your thought about poetry contributing to the memorable-ness of a sermon. I heard a preacher two weeks ago speak about the woman with the alabaster jar, and the way she wove ‘sinner’ and ‘dinner’ into the same sentence was, well, more poetic than I can make it sound here, but it was great, and stuck with me, and is enough to recall more of her tone and message. You say maybe we shouldn’t all preach like poets all the time. Who knows? But one demographic that may particularly appreciate poetry in sermons is the ‘mature Christian’ who has heard many expository messages over the years on each text we preach on. Perhaps a poetic window into introspection, indwelling the text, and quirky leaps of thought is just what they need for fresh insight and interest.